The monkey king Songoku, from the Chinese story "Journey to the West," creates an army by plucking out his fur and blowing it into the air - each hair becomes a new monkey-warrior. 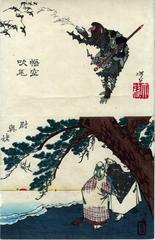 Jō and Uba represent longevity and marital harmony, immortalized in the Noh play "Takasago" in which the old man and aged woman's spirits come to reside in pine trees. The series illustrates episodes from Japanese folklore and history in a light-hearted manner. All of the prints are chūbans (printed in pairs on ōban sheets). They were published by Funazu Chūjirō (Marks 077). Sketches by Yoshitoshi (Yoshitoshi ryakuga - 芳年 略画) is how this series is popularly known, but there is no real title to this publication. There is another copy in the Shizuoka Prefectural Central Library. The top half of the sheet is listed in Beauty and Violence: Japanese Prints by Yoshitoshi 1839-1892 by Eric van den Ing and Robert Schaap, #42:15, p. 127. The bottom half is listed at #42:16.